About six months ago, Canada legalized recreational marijuana, making it only the second country to do so after Uruguay. Adults 18 and over can purchase cannabis oil, seeds, plants and dried cannabis, and possess up to 30 grams (1 ounce) of dried cannabis or its equivalent. Regulations for edibles are still pending. Overnight, it suddenly became legal to shop for pot at authorized retailers, or to smoke and vape cannabis, including in a designated area outside the terminal building at Vancouver Airport (YVR). Here, as well as at other border crossings, signage reminds travelers that it is illegal to cross international borders with marijuana. In January 2014, Colorado became the first US state to legalize cannabis for recreational use. Since then, nine other states have followed suit. In total, marijuana is legal medically or recreationally in 33 states across the country, plus Washington, DC. Cannabis is becoming normalized, and the steady decriminalization and legalization is opening doors for a flourishing pot-tourism market. Gone are the days of travelers flocking exclusively to Amsterdam for its famous coffeeshops. Now, there are luxury wine and weed tours in California. And travelers may soon be heading to the Great White North in droves exclusively to peruse the nation’s dispensaries. But though the pot tourism sector is likely to thrive, travelers seeking legal highs across state lines or international borders need to be extremely careful. “If it’s obvious that someone in the car has smoked or we smell it, you may be subject to search at that point, but barring [possession, they] would be allowed to continue,” the agent said. That’s because once you enter a security checkpoint, federal law enforcement takes over. And pot is illegal under federal law, with an attorney general who has been vocal about his opposition to legalization. Basically, crossing a border with a souvenir blunt could land you in serious trouble. The guidelines that apply to travelers returning from a visit to Canada are the same regulations that cover travelers moving across state lines — even if you’re flying from one state where marijuana is legal to another state with similar laws. In other words, you’re going to have to deal with the feds. According to the Transportation Security Administration, their main focus is to stop items that could potentially put a flight in jeopardy, such as explosive devices and weapons, from making it onto the plane. However, they are also required to involve local law enforcement if they detect a federally illegal activity or possession. McCarthy explained that regardless of the passenger’s destination, origin, how much of the substance he or she has and even whether or not they have a medical-marijuana card, the TSA is still required to notify the police of anything discovered during a screening. From there, it is up to the local police department to determine the next steps. Travelers caught with marijuana should know that the repercussions can vary widely depending on that specific state’s policies on possession. In Oregon, for instance, law enforcement will often — but not always — let passengers carrying marijuana fly to another destination within the state without having to dispose of the substance. In some cases, the officer may allow you to pass through security with a little bit of weed in your pocket. But in others, you may find yourself with your hands cuffed behind your back. Beware in Idaho, South Dakota and Kansas, tokers! Many airports in weed-friendly states will allow passengers to return the cannabis to whoever dropped them off, bring it back to their car or to leave it in an amnesty box. According to Rob Pedregon, a public information officer at Los Angeles International (LAX) — one of the busiest airports in one of the largest weed-friendly cities — their focus is on educating the public, rather than writing citations and putting people in handcuffs. Pedregon added that possessing a quantity larger than what’s legal (in California, that’s 1 ounce) and trying to transport it is what’s going to really get travelers in trouble. While substances with tetrahydrocannabinol (THC) — leaf marijuana, edibles, oils, hash — are illegal under federal law and not permitted during air travel, not all marijuana-derived substances are as straightforward. Some, such as hemp products including cannabidiol (or CBD) oil, have extremely low or nonexistent THC levels, meaning users won’t feel a high from the substance. Here, things get murky. CBD oil derived from hemp is now legal (hemp was legalized under the 2018 Farm Bill, signed at the end of December in 2018). As a result, officials are less likely to care about a CBD gummy than a nugget of pure pot — but travelers should still be cautious traveling with these goods and tinctures. That’s because CBD extracted from a cannabis plant may still be illegal. 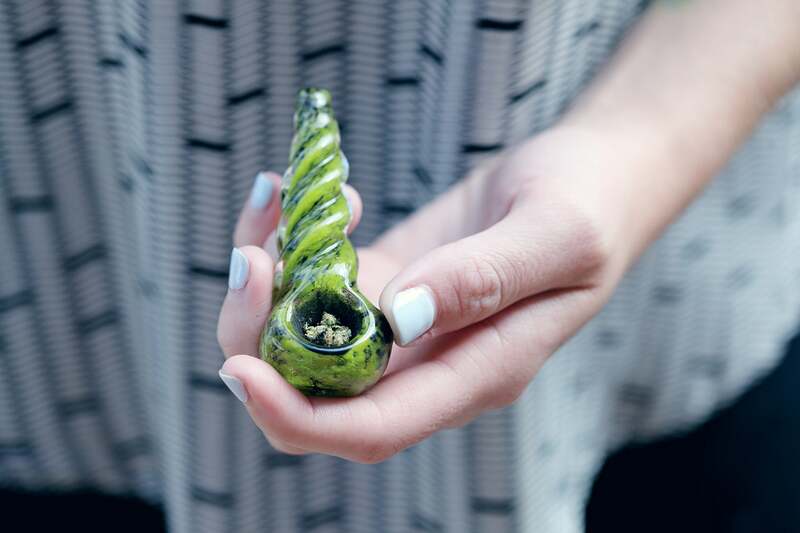 Marijuana paraphernalia, such as a bowl or pipe, can be brought through security as well. At LAX, specifically, even if something contains resin, there is no issue — assuming it’s not usable. However, TSA officials are not trained specifically to differentiate between various types of cannabis products. So if they see something suspicious (think: a bong) that may be associated with federally illegal substances, it will likely be reported to local law enforcement. Sure, you may end up on the plane with everything in your bag. But there’s a chance you may have to deal with some delays. When considering traveling with cannabis or cannabis-related products, it’s important to fully understand both state as well as federal law, and be well-versed with the consequences associated with possession in the US law enforcement at the airport — especially in weed-friendly states — may have bigger bongs to hit than the joint in your pocket. But risking travel with a federally regulated substance will no doubt be an inconvenience, if nothing else.